Cognitive computing is poised to change the way that IT approaches the infrastructure on which mobile enterprises are built. After all, there are many benefits to cognitive mobile. Its rise will allow businesses to optimize every decision and transaction — both in-house and business-to-consumer — in an effort to empower integrated experiences that are relevant, personalized and packed with data-driven insights. However, in order to realize the vision that mobile cognition creates, enterprises must take a forward-thinking IT approach, one that focuses on adjusting existing infrastructure. Here’s an overview of how executives and IT leaders can strategize for a cognitive mobile future. It’s clear that the mobile app economy has already been a driving force behind the transformation of enterprise IT. As consumers and business leaders now expect mobile experiences and form factors to be responsive and personalized, IT must work within short, frequent development cycles, ones that result in apps that can be supported across millions of devices. The mobile tools on which businesses rely must now arrive in an ecosystem that is optimized to provide near-frictionless transitions between development and operations phases. This ecosystem is poised to change even further. According to InfoWorld, the long artificial intelligence winter is over. Once stymied and stalled by cycles of hype and disappointment, artificial intelligence developers have returned under the new moniker of cognitive computing. This return has served to do away with old stigmas surrounding expectations of delay. Now, cognitive APIs create a condition in which data-driven app developers are finally able to leverage cloud-based learning and scale it throughout the app ecosystem. Infrastructure leaders must enable ecosystem integration so that they can optimize their transaction and analytics processes. As CIO points out, cognitive computing platforms should offer interfaces that are fine-tuned to each mobile OS environment. All enterprises should seek out mobile cognition that can interact with APIs, optimize picture encoding and leverage data caching in new and powerful ways. Ecosystem integration additionally calls for enterprises to connect to the marketplace, thereby embracing APIs as a primary avenue for working with clients. Different industries will emphasize and demand different interfaces beyond mobile digital assistants. For instance, as CIO points out, an insurance mobile app may seek to describe a medical condition by collecting pictures and text, and then using cognitive APIs to provide real-time analysis and recommendations. On the other hand, in the construction or public safety space, users may prefer to interact with an app through voice interfaces as opposed to touchscreens. 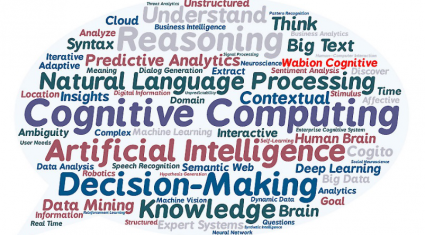 Cognitive computing will drive and reflect these kinds of changes across verticals. The old days of in-house development are changing too. In the cognitive computing era, IT infrastructure is becoming newly responsive. Partnerships will evolve around third-party providers who can give existing departments an even deeper bench of expertise in pursuit of the mobile cognition future. It’s clear that there is significant evidence of changing infrastructure across industry verticals. In some examples, the actual physical space that infrastructure used to occupy is changing as well. This type of flexibility plays a major role in the future of enterprise-level mobile cognition. IT departments that can shift to meet the new demands of the mobile cognition future will be the conduit to keeping revenue and brand awareness from slipping away to competitors.